The MIDI keyboard is an essential piece of kit for any producer or artist, and thanks to advancements in playing assistants you don't need to be classically trained to create professional sounding music with ease. 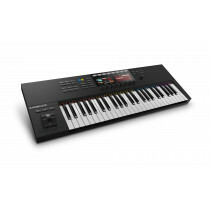 Many of the MIDI keyboards that we stock have evolved to become complete DAW controllers with the inclusion of transport controls, pads, faders and pots which can be assigned to control different parameters of the software and hardware that you're using. If you're just starting your journey into music production you might be tempted to skip the purchase of a MIDI keyboard and muddle through drawing notes in directly to your DAW - while this method of production does work it can be slow and laborious, taking the excitement out of jamming along to the track your creating. Don't worry if you're music thory isn't up to scratch - Native Instruments have built chord and scale indicators into the Komplete Kontrol range of keyboards and there's even a one note chord functionality to ensure you're never out of key. If the Komplete Kontrol range isn't for you, there are chord assistant plug ins available - Cubase even has this feature built in! Whether your playing style demands the weighted feel of a traditional piano keybed or you're just in need of a MIDI keyboard to play along we have a wide range in various sizes including 25, 49, 61 and full size 88 note keyboards available and as mentioned earlier, you can choose a model with pads, pots and other modulation controls aside from the standard picth and modwheel if required. 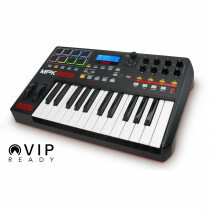 The M-Audio Code 25 is a USB MIDI Controller with semi-weighted keys, 16 velocity sensitive pads and an X/Y touch pad. 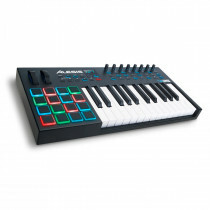 The M-Audio Code 49 is a USB MIDI Controller with semi-weighted keys, 16 velocity sensitive pads and an X/Y touch pad.